From Old Palace Yard it was a convenient short stroll to the Department of Business, Energy & Industrial Strategy on Victoria St, outside which the Unite Restaurant, Catering and Bar Workers Branch and Unite Community, including staff from TGI Fridays were holding a short protest reminding business secretary Greg Clark of his predecessor in office Sajid Javid’s promise to stop employers stealing the tips paid by credit cards from staff. 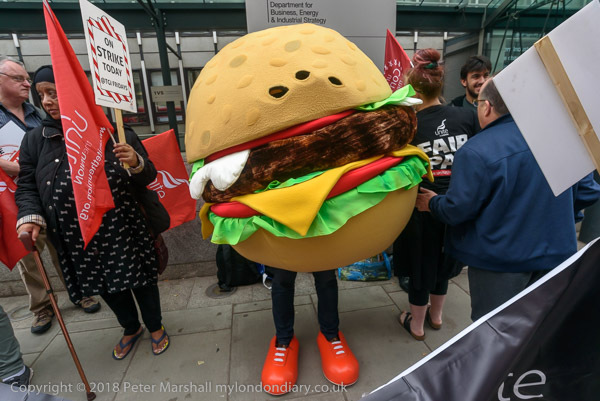 Among those protesting was one dressed as a giant burger, though I don’t think either Unite or I really made use of this. I’m there to record events, not to direct them. I won’t tell people how to arrange their protests, and rely on them to decide how they want to do things, but this doesn’t always make for good pictures. 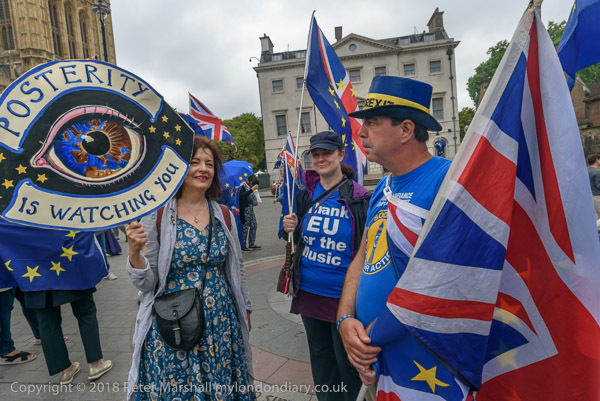 Our conventional trade unions are often rather lacking in their ideas about protests and photographs of protests, and trade union magazines and web sites arwe often full of rather boring group photos that I dislike making. From Victoria St I wanted to be at SOAS, a little under two miles away. I should have thought ahead and brought my bike with me to London, as there would have been no problem with having it with me at any of these three small static events. For larger protests and marches, having a bicycle tends to be an encumbrance, and leaving a folding bike like my Brompton locked anywhere in London is a gamble I seldom like to take. A relatively high value machine, easily lifted into a car boot or van and readily sold they are effective magnets for theives. But at all three of these protests I could have locked it to a lamp post or stand within sight of where I was working, and that mile and and three quarters would have been less than a ten minute ride. Bikes don’t get held up much by traffic, while my buses certainly did. It would actually have been slightly faster to walk the whole way (I’m usually quite a fast walker), but you can’t know that when you start your journey, and my legs would have suffered. The journey took 35 minutes, an average speed of just under 3 miles per hour. Most journeys in central London are faster by tube – and this is certainly more reliable than buses, but this is one which isn’t. TfL’s journey planner does suggest a combination of two tube journeys and walking would be fastest, but tells me it would have taken me 37 minutes, two minutes more than walking the whole way. Sometimes biking is by far the best solution. Of course for the wealthy there are taxis, but freelance photographers can seldom afford these, and they get held up in the traffic too. 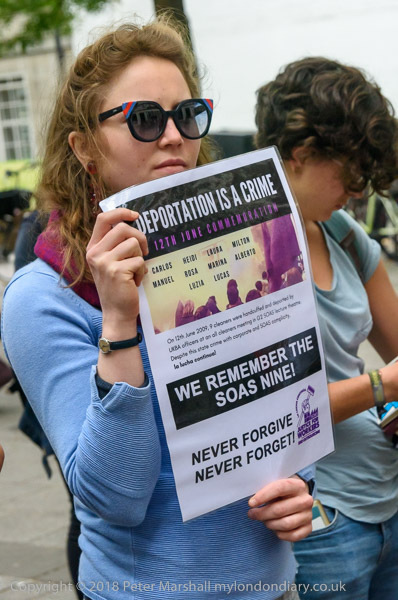 At SOAS, students and staff were remembering the shameful events of nine years earlier, when SOAS management called their cleaners to an early morning ‘meeting’ where agents of the UK Border Agency rushed in, handcuffed all of them and held them for questioning. Nine were then deported. The action was a part of the despicable ‘hostile environment’ for migrant workers, begun by the Labour government, but severely ratcheted up by Theresa May as Home Secretary. People at the protest held posters with the names of the nine who were deported. 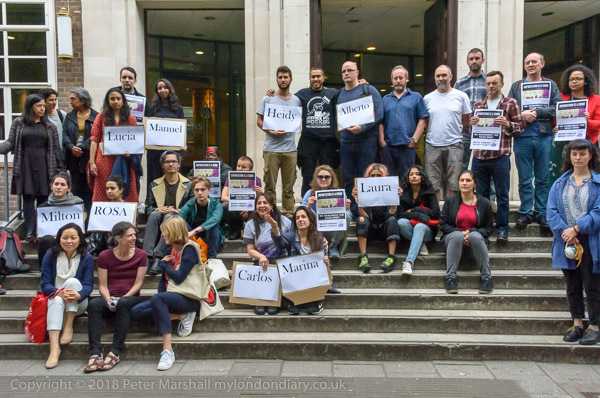 SOAS management took the action as retaliation over the trade union activities of their cleaners, members of Unison, who had begun to campaign for a living wage and to be directly employed by the university rather than being employed on terrible conditions and low pay through cowboy cleaning firms. 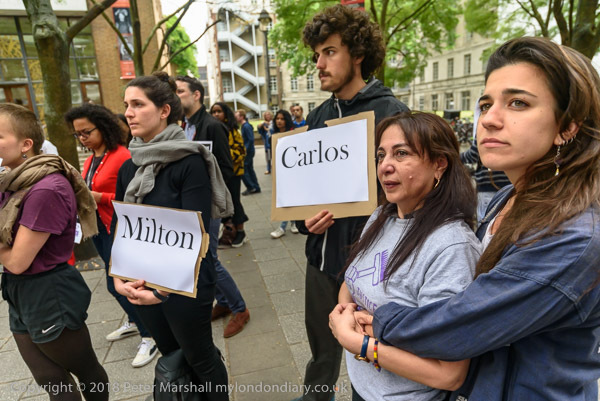 They got the living wage – but then nine were deported. Eventually, ten years later, after a continuing struggle, the management finally agreed to bring them ‘back in house’, though at the time of these pictures the details had not been finalised. They are now directly employed and both SOAS and the employees are better off. This entry was posted on Tuesday, October 16th, 2018 at 10:34 am and is filed under My Own Work, Photo Issues, Political Issues. You can follow any responses to this entry through the RSS 2.0 feed. You can leave a response, or trackback from your own site.